Fully 43% of male tablet owners consume news daily on their device versus 32% of female tablet owners. The gap is nearly identical on smartphones (41% compared with 30% among women). 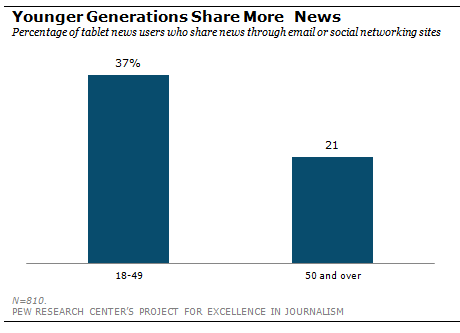 Age, on the other hand, seems to be less of an indicator of mobile news consumption. This is particularly true on the tablet, where daily rates are similar across all four age groups studied (50- to 64-year-olds are a bit more likely than the youngest and oldest groups to get news). On the smartphone, owners under 50 get news at higher rates than those over 50. 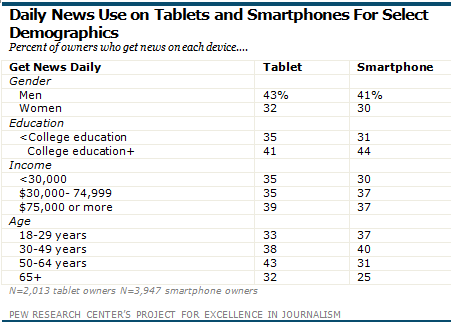 The survey delved deeper into more specific news habits on mobile devices. A majority of consumers across the various demographic groups check news headlines regularly on their devices, but other consumption habits vary. Age, often in combination with gender, plays a substantial role. But in many cases 30- to 49-year-olds are in sync with those under 30. The split, then, appears between those under 50 and those 50 and older. On the tablet, male news users under 50 are more likely than female news users under 50 (and both genders over 50) to check news more than once a day. Nearly half of male tablet news users under 50 (48%) get news on their tablet multiple times during the day versus just 33% of women under 50 and 31% of men and women 50 and over. 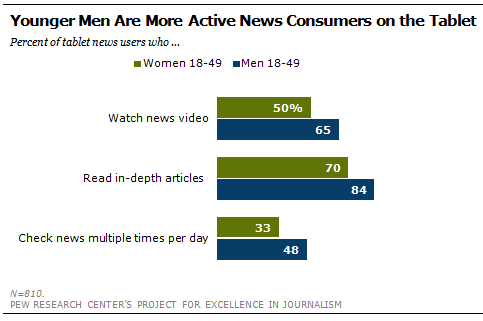 Male news users under 50 are more avid readers of in-depth news articles on the tablet. Fully 84% do so at least sometimes, versus 70% of women under 50 and 65% of both genders over 50. In-depth news reading on the tablet is also more prevalent among those who have graduated from college compared with those who have not, 82% versus 66%. One area where women under 50 stand out is in incidental reading. While they are less likely than men of this age group to read in-depth articles on the tablet, women under 50 who do read longer articles are more likely than men of this age group to come across and read in-depth articles they were not originally looking for (82% versus 66%). Another type of news consumption made more available through apps and other mobile technology is the reading of back issues of magazines. On the tablet, this practice is more popular among younger news users. Nearly a third, 32%, of those under 50 sometimes read articles from previous issues of magazines compared with just 20% of those who are 50 or older. Technical advances in the last year have also enabled more watching of news-rather than just reading-on mobile devices. 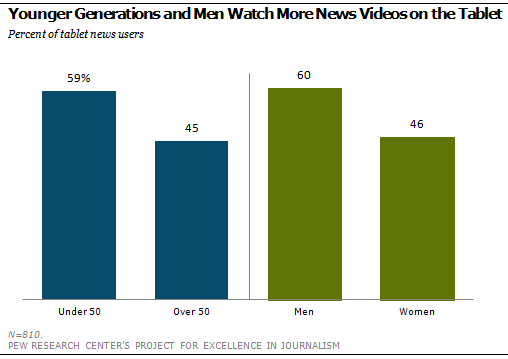 Again, on both smartphones and tablets those under 50 show a greater tendency to watch news videos-and on the tablet men do so more so than women. Sharing news through email and social networks is also more prevalent among those under 50 on both the tablet (37% versus 21% of those over 50) and smartphone (37% versus 28%). On the tablet, those in homes earning less than $30,000 also stand out as more likely than higher income brackets to share news through email or social networks and to post comments.